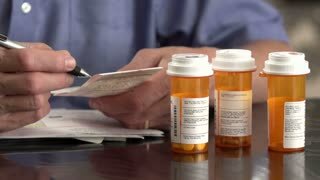 Search Results for "medicine cabinet"
A woman pharmacist grabs prescription pills in slow motion. The pain killer drug tablets represent pharmaceutical substance abuse in teens, recreational drug use of opiates, overdoses and the repeal of the affordable care act. 1960s: Nurses talking at desk. Nurse takes bottle out of medicine cabinet in the background. 1950s: Man removes container of Ammonium Alum from medicine cabinet. Microscopic particles. Man pours medicine into spoon. Microscopic crystals bloom. Man pours eyewash into cup. Dolly or slider shot of many glass test tubes of various forms with different liquids in medical or scientific laboratory. Medical or scientific research concept. Research tools. Handheld shot of scientist in light blue smock doing chemical test or making experiment in modern laboratory. Many test tubes and other medical equipment on the desk, hands in nitrile gloves. 1968 - Curious Alice drinks a substance from the medicine cabinet that makes her smaller so she can follow the rabbit. Hands of the cosmetologist make small injections with a syringe under the eyes of the client. Smoothing of wrinkles on the face with a subcutaneous preparation. 1947 - A housewife views Plexiglas shelves in a medicine cabinet, trays in a dressing table, shoe racks and a transparent front wall to a bedroom in a dream suite. An actress shows household products made using salt and salt is also used in the creation of paint, parts, munitions and salt tablets for soldiers, in 1958. 1917 - An animated husband overeats despite signs asking for food conservation during World War 1 and he is hospitalized and, after Uncle Sam appears to him, he recovers and throws away a bottle of medicine. 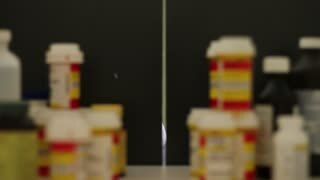 Woman dumps prescription pills from a bottle in slow motion. The pain killer drug tablets represent pharmaceutical substance abuse in teens, recreational drug use of opiates, overdoses and the repeal of the affordable care act. 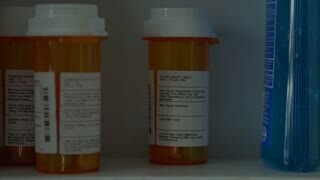 A woman dumps pills from an orange prescription bottle directly above the camera. The pain killer tablets represent pharmaceutical substance abuse in teens and recreational drug use of opiates.